My husband, whom I have lovingly named Mr. Fix-It, and I had a Plan. Plan A was a lesson in futility. Plan A involved selling our existing house and building a new one in the town next-door to ours. We wanted to get our boys into a better school district and break free from the small constraints of our little old house. Our three sons are growing fast, and the walls of our house sometimes tremble at the effort to stand upright against their active play. By the time they are teenagers, I fully expect our house to crumble down around us. My husband also was ready to hang up his Mr. Fix-It tools for awhile after spending nearly 10 years in a house built in the 1930s. The house's quirks were making my husband quirky. So about three years ago, we came up with Plan A. We spent six months doing home-improvement projects every spare minute to get the house ready for market. We hung drywall, we mudded, we sanded, we painted, we stained window trim and asphyxiated ourselves refinishing our hardwood floors. We replaced windows and finished and hung new doors. We purged junk, deep cleaned and put things in storage. In the nine years we'd lived here, our house never looked so good, or so empty. Then we spent four months trying to sell it. Because we have so few spare minutes, it took us longer to get the house ready than we expected, so our time frame to sell was short by today's weak-market standards. We had a very solid reason for it, though, and that reason didn't give us any wiggle room. We had hoped the extra effort we made in getting the house ready to sell would pay off. It very nearly did. The first week it was on the market, one woman came through four times: two open houses, once by herself, and once to show her family. We thought we had her. Then she made an offer on the house down the street the very next week. The following week we had another interested buyer who came through three times: twice by herself and once with her mother. Until the day we took the house off the market, she was still "interested." Our time ran out, so we revised our dream. We have now finished Plan B. It's "only" been nearly three years since we took our house off the market. Our Plan B involved refinancing our home loan and ripping the kitchen out, down to the studs. The kitchen is the one room in this old house that we hadn't updated in any way, except for the new plumbing we installed when we first moved in. 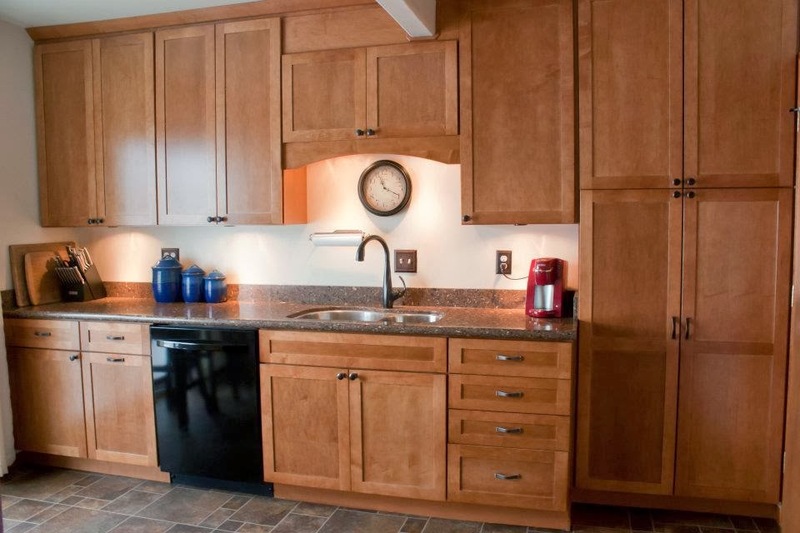 The kitchen had 1950s cupboards and countertops and a 1958 Westinghouse faux double oven. You read that right. 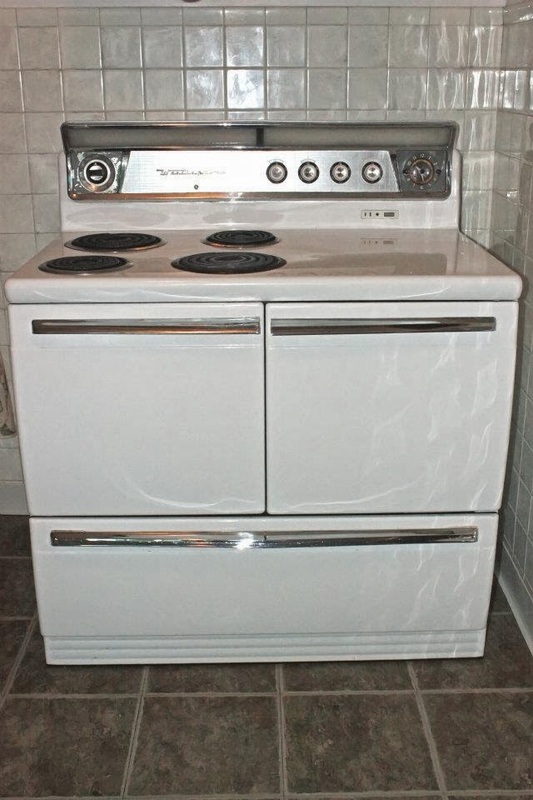 A faux double-oven. The oven itself was more narrow than standard width and too shallow to put today's standard-size cookie sheets or roasting pans in without them propping the door open. Did I mention only one of the four burners worked? I cooked multiple-dish dinners for five people on one burner for almost 10 years and mostly managed to serve those meals hot. Can this be considered a talent? At one point, one of the oven coils burned out. I thought, "Great! I get to have a new stove!!" I was soooo excited. Enter my Mr. Fix-It. He actually found a store in town that could order a new replacement coil for a 1958 Westinghouse oven. I couldn't believe it. I really thought I had a new oven in the bag. I mean, what are the odds of finding a working replacement part for a 60-year-old oven? Mr. Fix-It not only found a replacement part, he found a NEW replacement part. The Beast stayed. I blame it for our house not selling. Or maybe it was the rest of the kitchen. The floors were peel-and-stick vinyl tiles that hadn't been stuck on straight. The walls were covered with plastic, glued-on tiles that popped off anytime moisture came between the tiles and glue. It's a kitchen. With a sink. Guess how often I was gluing tiles back onto the wall around the sink? At one point, I gave up on a particular spot that no tile would stick to. I put a nail in the wall and hung a clock over it. Maybe potential buyers looked behind the clock. 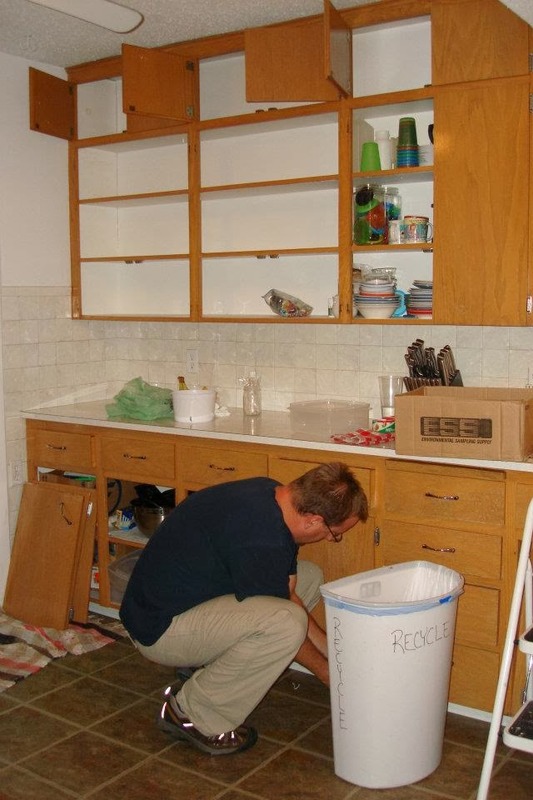 The old cabinets as Mr. Fix-It dismantles them. See how those ones on the top are hanging open? That's what they all did. All the time. The drawers had all fallen apart at some point, and every single one of them had been re-enforced with 1x3s by Mr. Fix-It. The cupboard doors were always hanging open because the magnets either were no longer magnetic or were not properly aligned to begin with. The interior of the cupboards had been painted white at some point. Whatever paint had been used flaked off. I tried sanding and re-painting the flaky paint, but the damage was done. My paint suffered the same fate. I would find my dishes full of white confetti on a daily basis. I would wash my dishes, put them away, and then wash them again when it was time to use them. Repeating myself is one of my pet peeves. You can imagine how this irritated me to no end. Did I mention all this dish-washing was by hand? Our 1950s kitchen had no dishwasher. When our house and it's fabulous 1950s retro kitchen didn't sell in our allotted time frame, Mr. Fix-It and I were both crushed. Our dreams of a beautiful new home died a painful death. 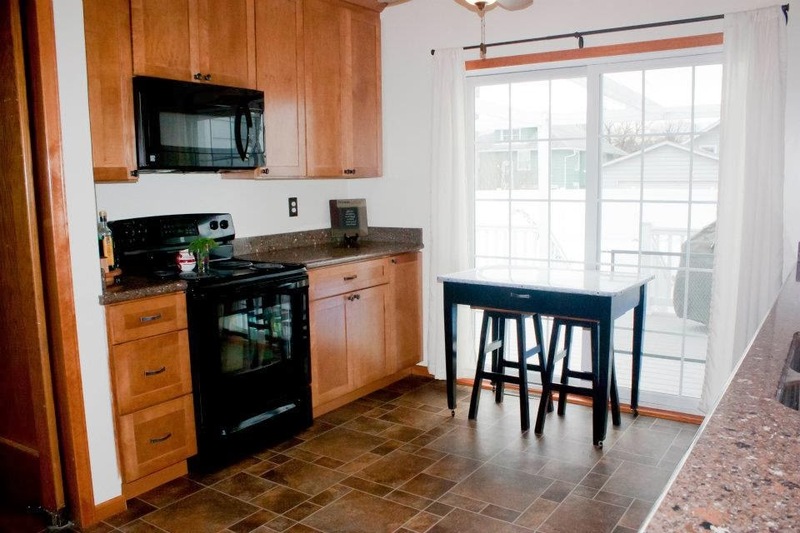 We grudgingly came up with the Plan B. Redesigning our kitchen gave us a new lease on life in our little old house. With the help of my father-in-law, we ripped out everything down to the studs and spent the next 6 months dealing with contractors, manufacturers and the quirks that come with a 1930s house. We discovered the two outside walls didn't have insulation, including the wall in which the previous homeowners installed a sliding door. Two out of the three new appliances we bought came broken in their boxes, several of the new cabinets were the wrong size, some of them were the wrong color and the countertop manufacturer delayed delivery four times. By the time the kitchen was finished, we were so stressed out we hardly cracked a smile. It was more a sigh of relief. Almost three years later, we are still in our little old house with the new dream kitchen. The quartz countertops have since cracked once, right next to the new stove with the four working burners that get really hot. If it hadn't been for the installer advocating on our behalf with the manufacturer, we'd still have new cracked counters. Fortunately, the installer was able to put in a new, unblemished piece. It "only" took 6 more months and several phone calls after I reported the problem. The older our boys get, the smaller our house still feels. The walls shake a little harder and the windows rattle a little louder, but everything is still standing. Who knows: maybe this starter home will be our forever-home. My Mr. Fix-It will have a hard time prying me away from my dream kitchen long enough to try and sell it. I LOVE this room in our little old house. I can't imagine selling it now. I take comfort that God has a master plan, which sometimes includes a Plan B that turns out better than our Plan A. Our dream kitchen. We planned every square inch. Every appliance works, including all four stove burners. I still catch myself only using one sometimes as I try to make dinner.